Posted on Thursday, September 11th, 2014 at 10:25 am. The slopes are not colour-coded like in a resort, so you’ll have to discuss with your guide what level of steepness you’re comfortable with (please also note that powder skiing usually requires slightly steeper slopes as the snow is slower than pisted slopes). Off-piste descents are not monitored, controlled or maintained. To some this may seem like a disadvantage, but the flipside is that when slopes are left in their natural state, your skis or snowboard sink in, creating the rush of gliding over virgin, untouched snow. It’s the best kind of skiing and snowboarding there is. Deep powder – the classic, cold, winter “champagne” snow (it shimmers in the cold air like champagne bubbles) that skiers and snowboarders love the most. Velvet spring snow – when conditions get warmer, untouched, smooth snow turns into lovely, spring snow. It’s slightly denser than powder, but just as fun to ski or snowboard through. Crust – this kind of snow forms on top of the powder, or spring snow. It can be amazingly good fun. Traverses – we often have to get from one side of the slope to the other, so we’d expect that all our snowboard and ski guests can safely traverse a slope without losing too much height. Steeps – very occasionally we might encounter a steeper slope than you’re perhaps used to skiing. We’ll help you down. Flats – some routes have flatter spots. But as you’re poling or one-footing across, take in the views – you’re alone with your group in a spectacularly wild part of the world. Enjoy it. There are, of course, many more types of snow, and our guides can advise what your day is likely to encounter. But the rule of thumb is: if you can ski or snowboard on powder, you’ll be fine with everything else! 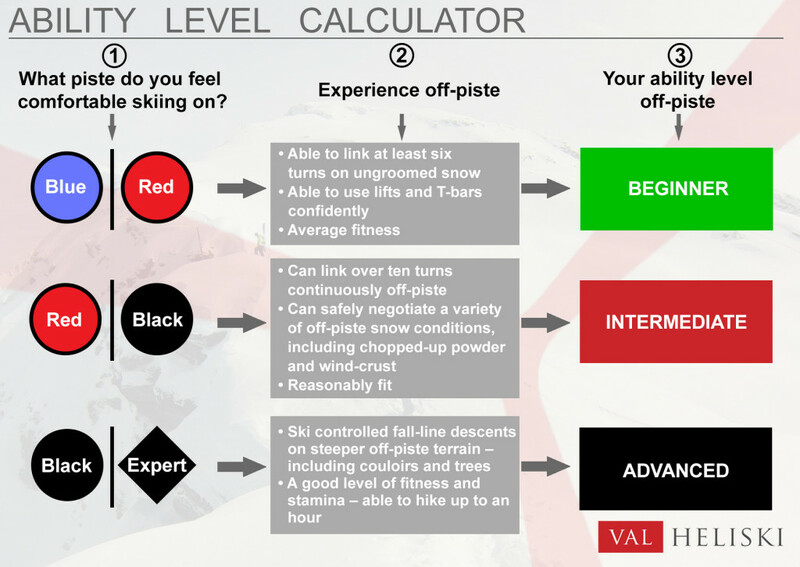 Look at our Ability Level Calculator below for a better idea of your off-piste ability level. Thanks for getting in contact, the dates were included in the image along with some of the other details of the trip. The date is for today (21/01/16) and unfortunately the spaces have been filled. I have however added your email address to our last minute interested persons list so you will be among the first to hear of future last minute seats.